Are you planning to spend Athens holidays? Exploring Plaka and Monastiraki is the most beautiful Athens walking tour for you and your children. All of you will enjoy the carefree walking on streets without cars and traffic lights and away from city noise. Under Acropolis, you will meet the most beautiful side of the city. 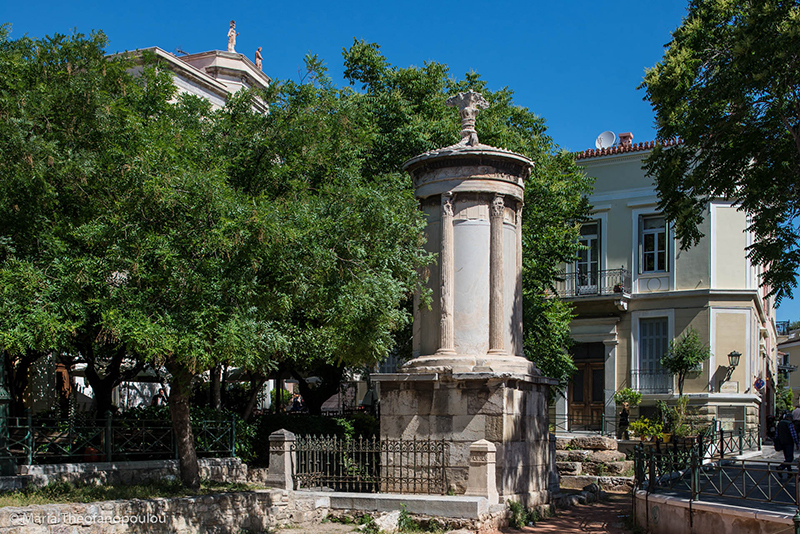 This walk reveals you the quietest part of the city, where you can find monuments from all historical periods and feel the atmosphere of old Athens. Looking for accommodation near Athens? Check out these private pool Holiday Villas! 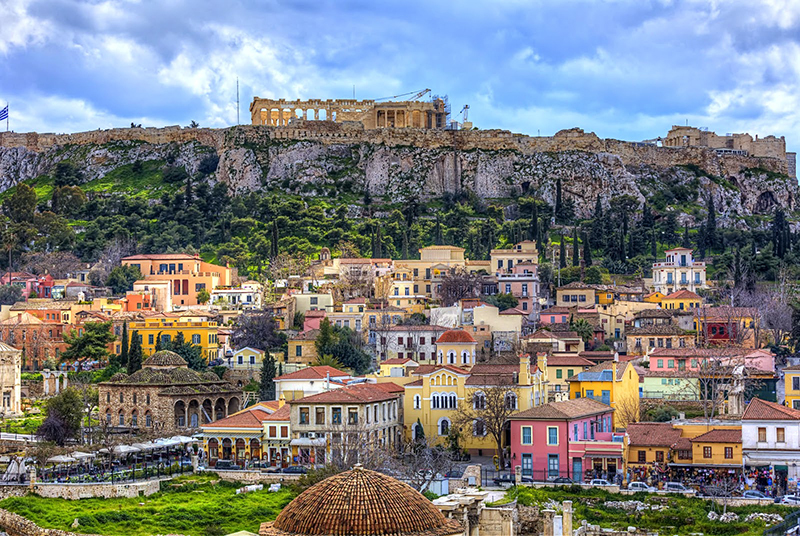 Start Your Athens Walking Tour From Plaka! In Plaka, you can find many different things: there are streets full of people, shops and restaurants, and streets that remind you of another era: old houses with flowers on balconies, colors and smells. Here, every monument has a special story to tell you. So, we suggest you to start your walk from the Metro station “Acropolis”. At the junction of Dionysiou Aeropagitou and Makrigianni Street (the pedestrian street outside of the metro) you will find the Byron Street. It is a quiet street with shops selling souvenirs, traditional food and sandals. Your children will certainly notice a huge leather sandal hanging outside of a shop with leather goods! On your left, there is a small square with many trees and a charming café-restaurant. From here, you have a wonderful view of the Acropolis which towers in the background, while in front of you, you see the monument of Lysicrates. Before you continue your Athens walking tour, it is worth taking a look on your right where you will see from afar the Hadrian’s Gate. It was built by the Athenians in 131 AD in honor of the Roman emperor Hadrian. Leaving behind the monument of Lysicrates, you meet the Shelley Street, a small street with beautiful neoclassical houses leading to the notorious Tripods street! 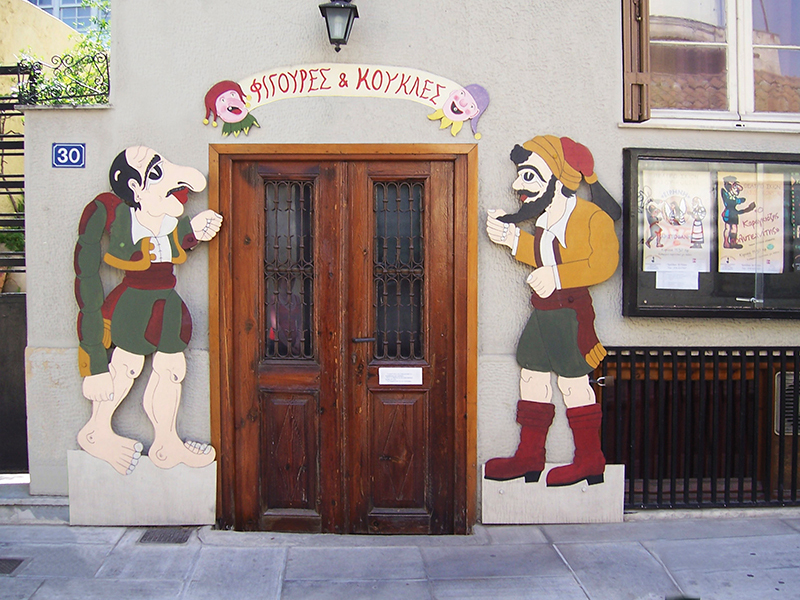 Today, you will not find monuments with tripods, but a shadow theater with two large “Karagiozis” figures at the entrance! The area also has been linked to “Karagiozis” after the first performance was given in 1852 in the narrow streets of Plaka. A little bit further, on Tripods street, there is a traditional dairy and enough places to eat, in case you already feel hungry. At the end of the Tripods street, you go down on Flessa street and, directly opposite an impressive stone house, turn left into Kyrristou Street. If you have young children with you, now you can leave them out of hand, as there are no cars passing from here! A few meters further down, on your left, you will find the Hammam of the Winds, the only Turkish hammam from the Ottoman period that still exists. It operates as a museum and is very nicely maintained. If visit it, you will see separate wings for men and women, lukewarm and hot rooms and the changing rooms. The hammam is closed on Tuesday, while the other days it is open from 8.00 until 15.00. Admission costs € 2, while for children and young people under 18 is free. 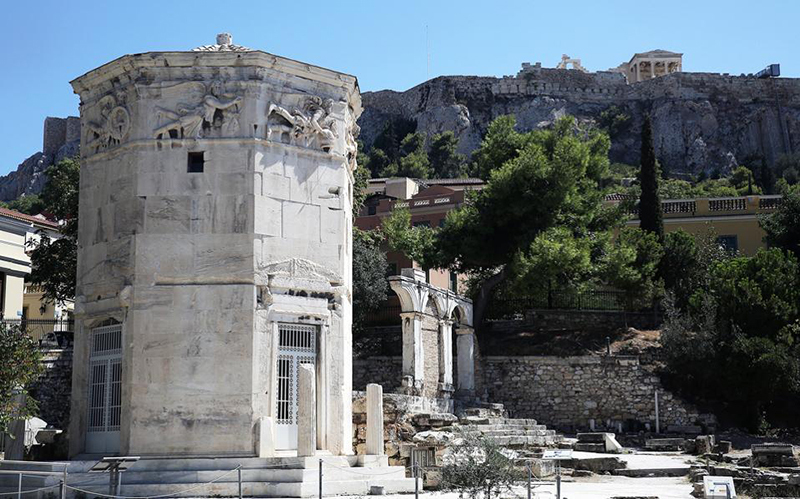 If you continue this Athens walking tour in Kyrristou Street, the Tower of the Winds in the background will surely attract the attention of all the family! The winds are pictured on the eight sides of the tower winds, one on each side, depending on the direction it blows. On the roof of the building once stood a bronze arrow showing each time which wind was blowing! Here, you have a great chance to rest in the square, in front of the Tower of the Winds, under the shade of trees, while your children are playing. Possibly,an itinerant musician will be there, playing beautiful melodies. In the square, also, lies the Greek Folk Instruments Museum, which is worth a visit. Admission is free to all and there, you can see and hear traditional instruments from different regions of Greece. The museum is closed on Monday and operates on Tuesday, Thursday, Friday, Saturday and Sunday 10.00-14.00 and Wednesday 12: 00-18: 00. Continuing your walk and going down on Pelopida street, you reach the Roman marketplace. There, you will see a building different from the others: it is a mosque built after the Ottoman conquest of Athens in 1456 upon the remains of a Byzantine church. It is called Fethiye Mosque which means “mosque of the conqueror”. You are now at Pan street. If you turn left into Epaminondas street, you continue walking along the Roman agora. The image that you will see here will surely fascinate you! There are preserved houses painted in different colors, balconies with flowers and on top of them, the imposing rock of Acropolis. 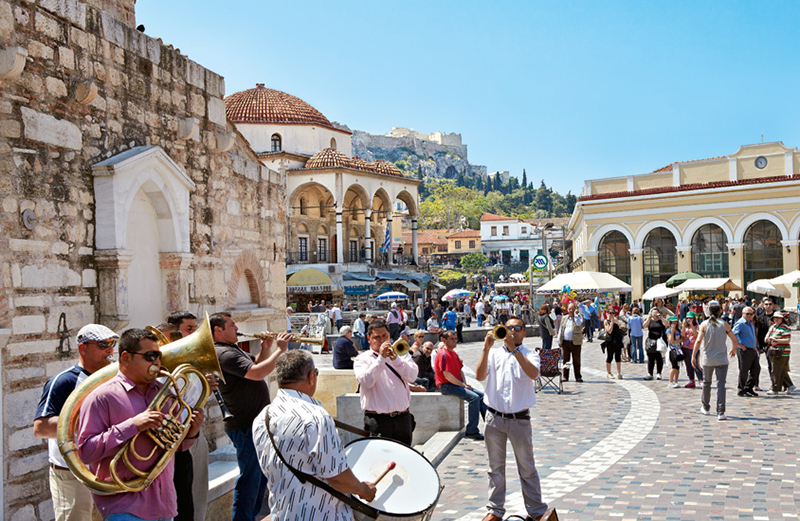 Your Athens walking tour ends in Monastiraki! You turn down at Areos street and you have now reached the Monastiraki Square. It is the last station of this special Athens walking tour. During the Turkish occupation, the area of the square called “ Kato Pazari” or “Square of the Fountain”. It was full of fabric crafts, tanneries and forges. You will realize that Monastiraki has preserved the character of the bazaar until today. Stroll in the narrow streets, visit the small shops and you will feel sensations and smells of other times nostalgic!